The long waited Lumigon T1 state-of-the-art mobile phone was yesterday unveiled in an international gala show in the city of Copenhagen, Denmark. Lumigon T1 is based on an open standard and Google's distinguished Android operating system with a special Lumigon P-GUI software, to give the consumer an extreme user experience. Furthermore, the exceptionally fast Freescale i.MX515 application processor and Option HSDPA modem with Qualcomm chipset are utilized, as well as a TFT 480 x 800 high resolution 3,5" wide touchgreen made of glass with a surrounding metal frame. Bang & Olufsen ICEpower technology guarantees superior audio quality both in the speaker, receiver and head phones. One of the most innovative features in T1 is a universal remote control, which enables the usage of T1 as control for a great variety of electrical appliances. The built-in learning function can memorize any command from virtually any device. T1 can also be used in the dock as a PC with HDMI / HD out to browse the Internet, read emails, watch pictures and movies, listen to the music and much more. In this respect, T1 literally replaces notebooks in home environment. Bang & Olufsen ICEpower technology provides T1 with high performance speaker and head phone amplifiers. It does not only mean low power consumption, but enhances the sound experience to all new heights. T1 shall reach the distribution outlets in selected markets by the very end of this year, the major volumes arriving during Q1. 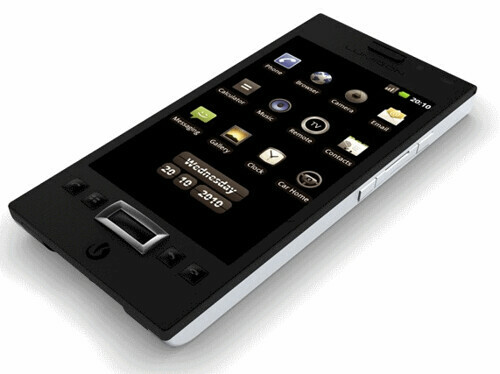 The sister product S1 with an in-built T9 keypad and slider is expected to be launched during Q3 2011.